David, Mauritius (1860-? ), his first name Mauritius is Latin for the English Morris or "Moe", and he is known to have sometimes used the French Maurice and the German Moritz. He was a coin and medals dealer since at least January 1898. The Gnecchi brothers supplied the year of his birth as 1860, which, as all information they supply should be checked since there were many errors in their text. In the 1905 U. S. Census we find listed one Moritz David, who was born in 1874 in Bremerhaven, Germany, listed as living in the United States for 12 years, married to Louise, who entered the U. S. in 1895. Both of them worked as accountants giving them access to specie of foreign and American coins. It is possible that this is the subject of this sketch, in which case he entered America in September 1892 and is first recorded in The Numismatist in August 1897. In 1905 he and his wife were living in a tenement house on East 9th Street. He became a U. S. citizen on 24 August 1903, listed as residing at 57 West 12th Street, and Leopold Dawraner was his witness, who testified he knew him since 1897. The obstacle to this identification is the signature on his citizenship application which hand does not match the handwriting on known pieces of correspondence of our Mauritius David. Regardless, his earlier activity has the appearance of being a collector seeking foreign coins and medals. It was in Vol. 10, September-October, 1897 on page 172 that he ran his first ad in The Numismatist looking to buy or trade European gold and silver coins and medals. Later on he became more aggressive and advertised in January 1898 to buy German Thalers and Doppel Thalers asking for lists and prices. Curiously, an article on German Thalers and Doppel Thalers by Philip Heinsberger appeared in The Numismatist, Vol. XI, No. 7, July (1898) : 175-178; and 205-207, and 241-244. Heinsberger touted that he was a dealer established in Europe since 1850. 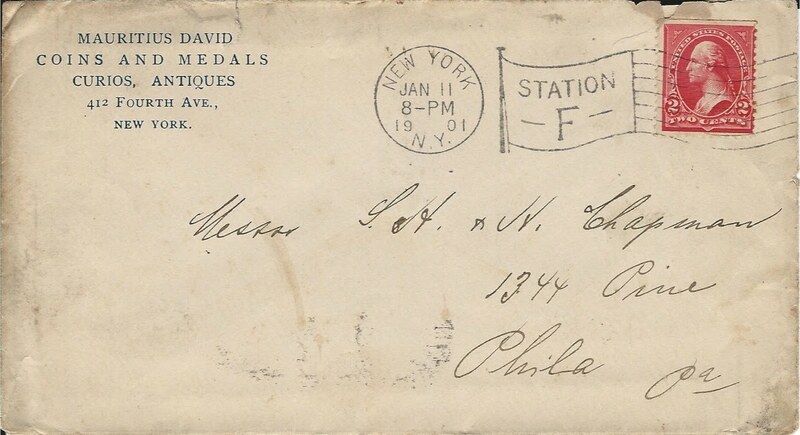 Mr. David ran advertisements in The Numismatist from January through April, 1898 in a campaign to establish himself as an international dealer and buyer. His display advertisements published with the others in the back matter of The Numismatist sought European silver and gold coins and medals with the exception of copper. "Whole collections bought or taken care of and sold at auction, either in this country or in Europe". Obviously he had enough funds to advertise purchasing entire collections, which is most probably how he acquired the $5 gold pieces he sold to Virgil Brand a little more than a year later. He seems to have moved annually at the end of a year's lease beginning in 1897 on giving the impression he is fleeing from landlord to landlord. 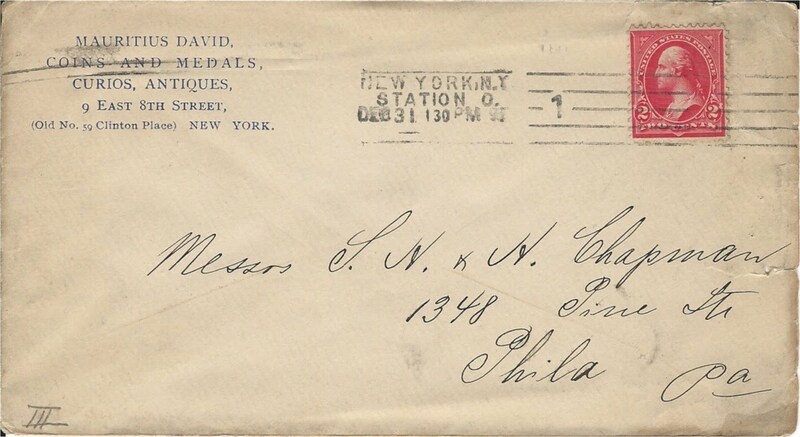 The earliest known correspondence with the Chapman brothers is dated August 8, 1898, eleven months after M. David's first appearance in The Numismatist. It is probable that earlier correspondence or at least some record of it may exist in the ANS Museum or in some other numismatic collection. The earliest specimens shown here were taken from the Lupia Numismatic Library-Special Collection-The Chapman Family Archive, comprising 31,000 whole and in part pieces of mail many with annotations and lengthy notations or dictated letters sometimes written in a cryptic form of shorthand and sometimes with dealer codes on coins and what they paid versus what they are selling them at and the calculated profit. The Chapman Family Archive was divided and scattered at the death of Helen Chapman and a modest portion intact was given to the ANS by Henrietta, Henry Chapman's daughter. The largest portion was apparently sold about 1959, and the greatest amount of that was collected by John N. Lupia at considerable expense, time and travel over a span exceeding a dozen years in order to reconstruct it as best as possible. Consequently, these few items shown here (there are dozens more) may not express perfectly as a documented record of what transpired at that time but it at least opens a window and gives us some idea of the transactions between the Chapman brothers and Mauritius David as well as informing us about him and his business in various ways. Fig. 1. Corporate collateral of Mauritius David in 1898. Note his first known address at 18 East 112th Street, New York. Photo courtesy of the Lupia Numismatic Library-Special Collection-The Chapman Family Archive. 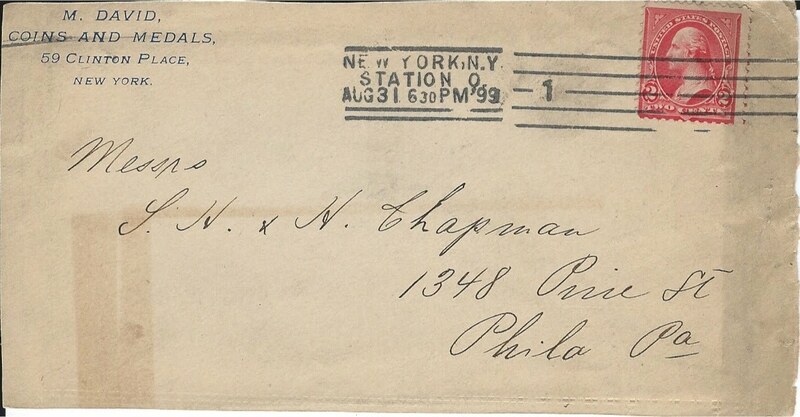 By August 1898 he moved to his second address. Note the incorrect address for the Chapman Bros., at 1305 Pine St, which should be 1348 Pine Street. 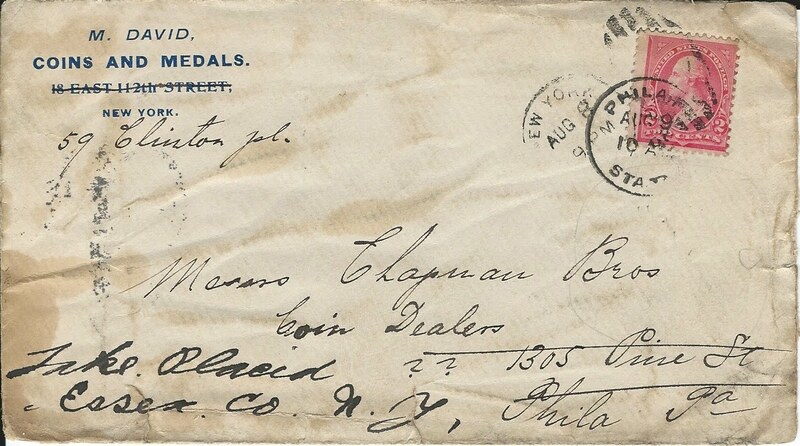 This mail was forwarded to Lake Placid, New York where the Chapmans spent their summers. His seven known addresses are : (1) in September 1897, 18 East 112th Street, New York; (2) to August 1898 at 59 Clinton Place, New York; (3) September 1899-1900 East 8th Street; (4) 1901 at 412 4th Avenue, New York, New York; (5) in 1902 he is listed at 9 North Moore; (6) later at 345 Fifth Ave., and (7) 121 West 115th Street, New York. Oddly, there is no listing for a Mauritius David in Trow's Business Directory of the Boroughs of Manhattan and the Bronx City of New York of 1898. Fig. 2. Corporate collateral of Mauritius David in 1899. Note his second known address at 59 Clinton Place, New York. Photo courtesy of the Lupia Numismatic Library-Special Collection-The Chapman Family Archive. His earliest known address 18 East 112th Street, New York was a four-story brownstone or brick apartment building owned by William C. Oesting, who was a builder. In August 1899 he applied for membership in the A.N.A. and is member No. 109. In August and December 1899, he placed orders for catalogues and coins, including a priced catalogue of the Chapman brothers auction held on December 22, and a new U. S. cent for 1900. Also in August 1899, on the 14th, Dave Bowers tells us that he sold Virgil Michael Brand high end $5 gold rarities including an 1815 for $200, an 1822 for $800, 1824 and 1826 for $60 each. Fig. 3. Corporate collateral of Mauritius David in December 1899. Note his third known address at 9 East 8th Street, New York. Photo courtesy of the Lupia Numismatic Library-Special Collection-The Chapman Family Archive. Note the different style of hand in penmanship especially evident on the capital letter "P". Fig. 4. Corporate collateral of Mauritius David in 1901. Note his fourth known address at 412 4th Avenue, New York. Photo courtesy of the Lupia Numismatic Library-Special Collection-The Chapman Family Archive. Apparently Mauritius David wrote the address incorrectly as 1344 Pine rather than the correct 1348 Pine Street. On January 6,1900, he published Antiques: A Weekly Illustrated Journal with a business address at 9 East Eighth Street and an annual subscription rate of $6 per annum. The serial was launched on the occasion of the 5th centenary of the birth of Gutenberg. The premiere issue was followed up with a single issue and ceased publication. He evidently intended the Antiques Weekly to be his house organ to sell his wares but ceased as soon as he started. One is left wondering if the content glaring on the front page of Volume 1, Issue 1 was the cause of its demise, since it was a vicious attack against the United States Customs House in New York whom, he insinuated or alleged chose excessively high import tariffs or duties on antiques and antiquities by the power of its Customs Inspectors who were arbitrarily pulling high numbers out of thin air at the rate of 50% unjust tax. One is also left wondering if M. David was over selling himself and his wares with his excessively high prices imputing the blame, not on himself or ambitious greed, but rather, allocating the later to the Customs Inspectors; a crafty but obvious dealer's ploy for profiteering under the guise of personal sacrifice where selling at twice its value only provided him with a meager living. He never perceived the adage he posited against the Inspectors as applying to himself, "Give the accused the benefit of the doubt." As one reviews these two extant copies one sees that M. David as an ambitious dealer of coins and medals in the long tradition of carrying all the other ancillary numismatically related collectibles of the classic Renaissance curiosities cabinet : curios, ivories, engravings, books, arms, silver work, pottery, furniture, etc. That same year he donated to the Museum of Fine Arts Boston a silver medal of the Inauguration of the newly built American Hall of Fame in New York City by the Austrian medalist, Anton Scharff (1845-1903). He was a donor to the ANS collection and Library from 1899-1901. Sometime between April and October 1900, he published the English translation of the exhibition catalogue of European coins and medals in April 1900 at Frankfurt by Ferdinand Luthmer (1842-1921), director of the Kunstgewerbemuseums, under the title , The International exhibition of medals in the Kunstgewerbe-Museum in Frankfurt o. M., April 1900. A notice of this was published by George Heath in The Numismatist, Volume XIII, No. 11, November (1899) : 305, after receiving a gift copy for the public announcement. In 1901, he donated two rare pieces to the Museum of Fine Arts Boston, (1) an early 16th century Spanish carved Ivory Triptych; (2) and another also early 16th century French Triptych painted on gold. In 1902, he copyrighted the Telephone Business Directory of the City of New York. In November 1902, David Proskey filed a judgment against him for the amount of $92. 97. He traveled to Hamburg, Germany in late 1903 returning on the ship Moltke December 5th. In the beginning of 1905 he made a trip to Liverpool, England and returned on the ship Majestic on February 16. He made another trip to Liverpool at the end of that year and returned on the ship Carmania on January 8, 1906. He arrived in New York on the Nieuw Amsterdam on September 11, 1906. In 1903, the Gnecchi brothers published their Guida Numismatica Universale, (Universal Numismatic Guide) 4th ed., and list M. David at 49 Clinton Place, New York in entry No. 5732. This is probably a typo for 59 Clinton Place, New York. In 1917, he sold Virgil Brand a Spanish 20 doblas for $600, and in 1921 a 1623 specimen of 100 escudos for $1,200. in fact, nothing more or less than an old Hebrew greeting or benediction, frequently used among religious Jews all over the world even to this day." Gnecchi, Ercole and Francesco, eds., Guida Numismatica 4th edition. (Milano : U. Hoepli, 1903. Edition) : 554, Nos. 5732, and 5733.